The children will hear each word read out in a sentence and they need to think about which of the spellings apply to that meaning. E.g: The walls in the kitchen were very plain. They need to decide which spelling is correct in the context of that sentence. 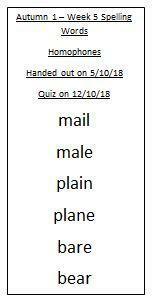 A homophone is two or more words having the same pronunciation but different meanings or spelling.